533.01 Dublin flute player Sarah Jane Woods, with accompaniment on keyboard by Martin Gaffney (also an excellent flute player), plays two Reels - “Paddy gone to France” and “Gorman’s”. They are members of Craobh Naithí Comhaltas branch and play with the Dodder Banks Céilí Band. 533.02 Taking 1st place in 15-18 Fiddle competition at Fleadh Cheoil na hÉireann 2017 in Ennis, Co. Clare, Andrew Caden from O’ Neill-Malcolm branch of Comhaltas in USA plays a Hornpipe - ( appropriately ! ) “The fiddler’s contest”. 533.03 All-Ireland senior Banjo champion for 2017 Brian Scannell plays a multi-part Jig “Paudí Ó Raffertaigh’s”. Recorded in Brian’s native Comhaltas branch Teampall an Ghleanntáin in West Limerick on 21st January 2018. 533.04 In Senior Céilí Bands competition at Fleadh Cheoil na hÉireann 2017, Ceoltóirí Crosskeys Céilí Band from CCÉ, Loughbeg, Co. Antrim, play a selection of Reels - “The wise maid” and “The mountain top”. Band members are - Maria Mitchell, Kate McSherry and Martin Agnew on fiddles; Seána Agnew and Leona Neeson on flutes; Lauren Hegarty and Eimhear Mulholland on accordions; Maireád Mitchell on concertina; Maeve Close on piano and John Agnew on drums. 533.05 All-Ireland Senior Button Accordion champion for 2016 Vincent Murphy from Ballyfad CCÉ, Co. Wexford, plays a Hornpipe in the 2017 competition at Fleadh Cheoil na hÉireann 2017 in Ennis, Co. Clare. 533.06 Clodagh Ní Cheallaigh from CCÉ, Cr. na gComarach, Co. Waterford, plays a Reel in 15-18 Fiddle competition at Fleadh Cheoil na hÉireann 2017 in Ennis, Co. Clare. 533.07 In Senior Trios competition at Fleadh Cheoil na hÉireann 2017 in Ennis, Co. Clare, Ciara Maguire, Niamh Howell and Matthew McAstocker from CCÉ, Caisleán Nua, Co. Down, play a Reel - “Kiss the maid behind the barrel”. 533.08 From CCÉ, O’ Neill-Malcolm, USA, Seán Heely, plays a Reel in Senior Fiddle competition at Fleadh Cheoil na hÉireann, 2017 in Ennis, Co. Clare. 533.09 Winning the All-Ireland Céilí Band 15-18 Competition 2017 for the 3rd year in a row, Crossfields Céilí Band from CCÉ, Craobh Chronáin, Co. Cork, play a Jig . The band is coached by Alan Finn, leader of the Shandrum Céilí Band who also won their 3rd title in a row (Senior) in 2017. 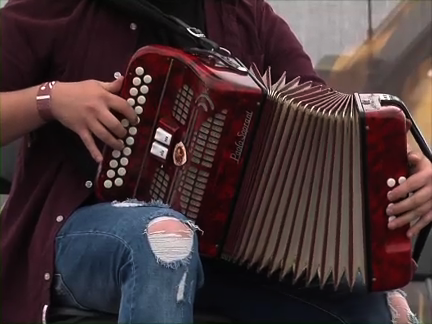 533.10 Recorded in her native Teampall an Ghleanntáin Comhaltas branch in West Limerick, concertina player Lisa Shine plays a selection of Reels ending with “Reel of Rio”. Lisa and her colleague Muireann Hickey took 2nd place in Senior Duets competition at Fleadh Cheoil na hÉireann, 2017 in Ennis, Co. Clare. 533.11 Naoise Kettle, CCÉ, Spink, Co. Laois, plays a Reel in 15-18 Fiddle competition at Fleadh Cheoil na hÉireann 2017 in Ennis, Co. Clare. 533.12 Scoil Éigse tutors at Fleadh Cheoil na hÉireann, 2017 in Ennis, Co. Clare - Ciaran Fitzgerald, Sineád Mulqueen, Clare Anne Kearns, Sandra Walsh and Deirdre Murphy - play a selection of Slip Jigs commencing with “Joe Kilmurray’s”. 533.13 Macalla na hÉireann, Comhaltas Concert Tour of Ireland 2017, musicians and dancers with a selection of Reels, commencing with “The drunken tinker”, in Brú Ború, Cashel, Co. Tipperary on 20th October 2017. 533.14 In Senior Fiddle competition at Fleadh Cheoil na hÉireann 2017 in her native Ennis, Co. Clare, Eimear Arkins, CCÉ, St. Louis Irish Arts, St. Louis, MO, USA, plays a Reel - “The porthole of the kelp” (B. Casey). 533.15 Well known Dublin Uil eann Piper Eoin Kenny plays a selection of Reels - “The silver spear”, “The wind that shakes the barley” and “The Dublin reel”. Recorded at a session in Comhaltas Headquarters - Cultúrlann na hÉireann, Monkstown, Dublin, on 22nd January 2018.